Perhaps you are familiar with the clean-lines of the Ikea Edland canopy bed, a piece that I've had for about two and a half years. For awhile now, though, I've wanted to soften the lines of the bed with a fabric touch. I hemmed and hawed for awhile about which direction to go in; did I want a canopy? A panel hanging at the head of the bed? A set of panels at each corner? And, like that, the decision was made; I'd add some panels to the left and right of my pillows. After rousing endorsements of Gray Line Linen from Jenny and Bryn, I opted for this $9 white linen to complement the existing color scheme in my bedroom. Over the weekend, my mom was kind enough to help with the sewing and she added a row of buttons to hang the panels to the frame of the Edland. The buttons make it easy to remove the fabric when they need to be dry-cleaned. To create these panels, Mom and I put together two 15" wide linen panels with little more than a straight stitch. The one detail that we added was a row of coordinating buttons at the top of each of the panels, which allows me to easily remove the fabric for dry cleaning down the road. I also chose to add a tie-back to both panels with the fabric I purchased. 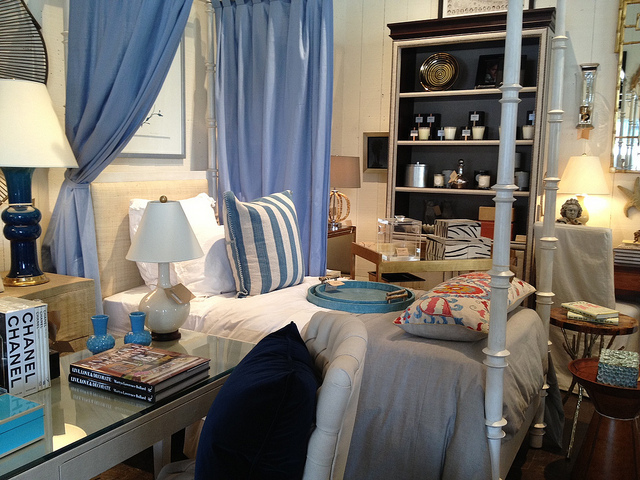 I love the cozy touch the linen panels add to the bedroom, while also drawing attention to the tall ceilings. I still have to add a piece of art above the bed to tie it all together. So pretty! 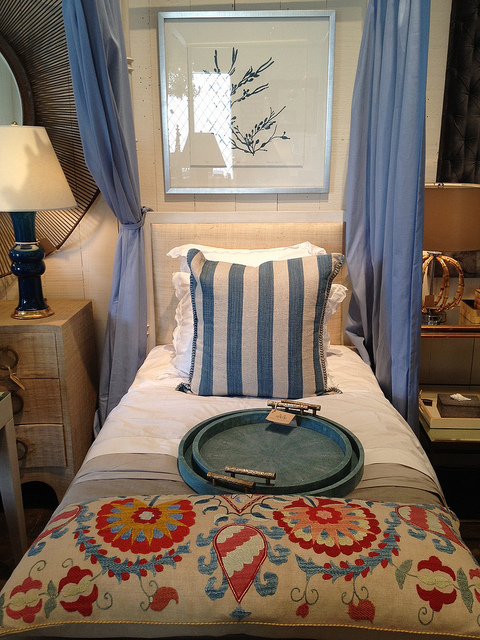 A little fabric is always nice to soften all the wood on a canopy bed. I like the effect. Have you considered adding curtains to the back/head wall as well? I love that look. Your bedroom is so gorgeous, Ashley. The curtains soften it up just the right amount! Mission accomplished: definitely softens things up. Looks great! I love the way it frames the headboard to make it more of a focal point. Your bedding is fantastic, btw. Love the scalloped edges and the personalization. Wedding gifts? Your mix of pillows is great! Love the whole room!